수렴동계곡과 구곡담계곡은 내설악의 대표적 계곡으로서 전체적으로 아주 완만한 계곡으로 백담계곡에 비해 자연스러운 맛과 그윽한 운치를 느낄 수 있으며 경치가 수려하고 빼어나다. 특히 가을단풍과 어우러지는 계곡의 절경은 이 길을 설악산의 대표적인 아름다운 단풍 길로 만들어 주며, 셀 수 없을 만큼의 소(沼)와 담(潭)이 계곡을 따라 펼쳐져 있어 아름다운 비경을 보여준다. 또한, 계곡에는 폭포(쌍룡폭포, 관음폭포, 용담폭포 등)와 폭호, 암봉 등의 수려한 경관을 보여주고 있다. 수렴동에 관한 옛 문헌 기록으로 김창흡(金昌翕: 1653~1722), 홍태유(洪泰猷: 1672-1715) 등이 있으며, 수렴동 계곡과 폭포를 중국의 황산보다 경치가 아름답다고 표현하여 역사문화 명승적 가치를 높여주고 있다. 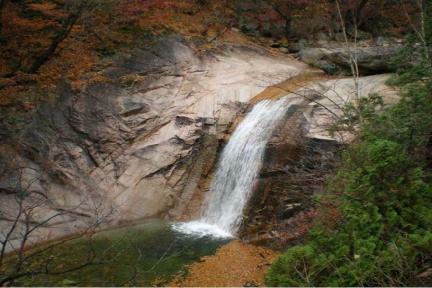 Suryeomdonggyegok and Gugokdamgyegok are famous valleys located in the inner area of Seoraksan Mountain. They have gentle features overall, offering visitors a quiet and secluded atmosphere as well as great scenic beauty. In particular, the valleys offer a magnificent vista characterized by red-colored leaves in autumn. The hiking trails running along these valleys are ranked among the best trails to appreciate beautiful autumn leaves around Seoraksan Mountain. Numerous basins and pools lie in the valleys, adding marvelous scenes to the surroundings, as well as a number of waterfalls including Ssangnyongpokpo, Gwaneumpokpo, and Yongdampokpo Falls, further enhancing the area’s outstanding scenic beauty. Several scholars and civil officials of the Joseon Period, including Kim Chang-heup and Hong Tae-yu, left behind many documents about Suryeomdonggyegok, including claims that the valleys and waterfalls were more beautiful than those of Huangshan Mountain in China.